Foundation recently launched their brewery in Portland with two beers; Eddy a saison and Blaze a heavily hopped saison. Both are excellent beers but I opted for a growler of Eddy partly because I was on a trip to 7 different breweries the stopped in and I knew I would be coming home with several growlers of beer. Eddy being the less hoppy beer should hold up better than Blaze. Being a saison it has a small amount of funk from the yeast and almost no bitterness. It also has a crisp dry finish that works very well with food. Appearance is a nice light orange with a single finger white head. Aroma is earthy and very crisp. Taste follows with a slightly spicy, earthy flavor that finishes clean.Eddy is a beer that works well on its own or with a meal and I can see why so many restaurants and bars have added it to their draft list. If you have not been to Foundation yet I recommend you make the trip. The brew system is truly impressive and Joel and John are both great guys. At the brewery you can taste both beers and possibly even some varieties of these beers and take home a growler of your favorite. Brewers Description: Eddy is a farmhouse style ale, also known as a Saison. Bright and lively, this beer is dry, light in body and color, but not in taste. We add hops that bring herbal and floral notes that meld with the spice and fruit flavors of our house yeast. These characteristics make for a beer that is delicious on its own or in the company of food. While it is a perfect beer to enjoy with classic summertime fare such as lobster and seafood, Eddy’s refreshing bitterness cuts through the richness of more casual fare, such as burgers and pizza, making it an excellent accompaniment year round. 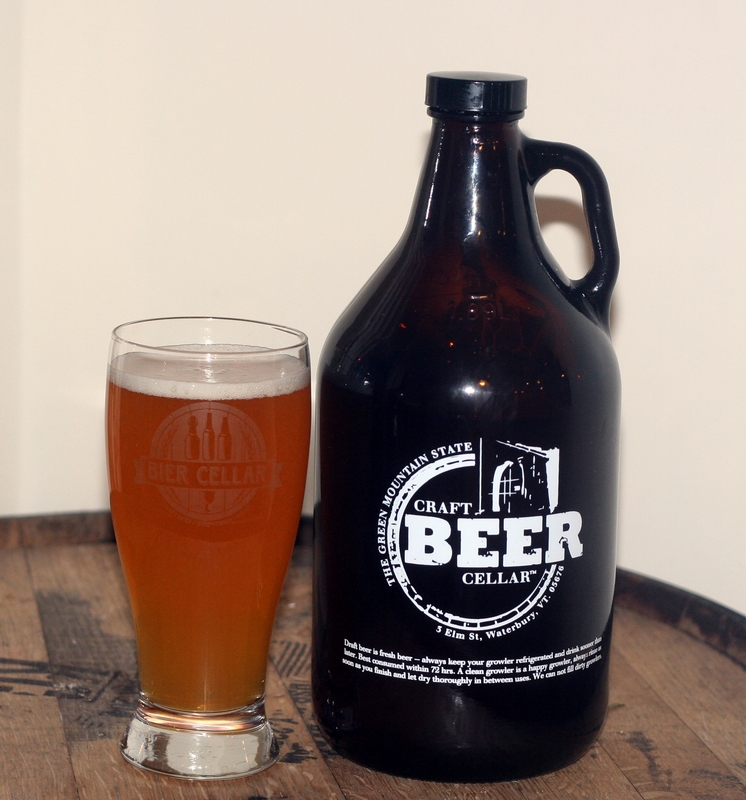 Picked up this growler at Craft Beer Cellar in Waterbury, Vermont. Unlike Maine, Vermont allows retails stores to fill growlers with beer and Craft Beer Cellar has a 6 tap growler bar which had all Vermont beers on when I was there. This is a great idea and I hope Maine follows suit in the coming years as it is a great way for retailers to increase their sales and for small breweries that do not offer bottles or cans to expand their distribution. Conehead is a wheat ipa and everything about it follows what you would expect from a wheat IPA. The color is a deep orange with a thin white head. Aroma is oranges and wheat which actually work quite well together. Taste is very similar with a solid hop start and a sweet malt finish. Almost no bitterness which is what I prefer. Conehead was extremely easy to drink and worked well on its own or with a meal. 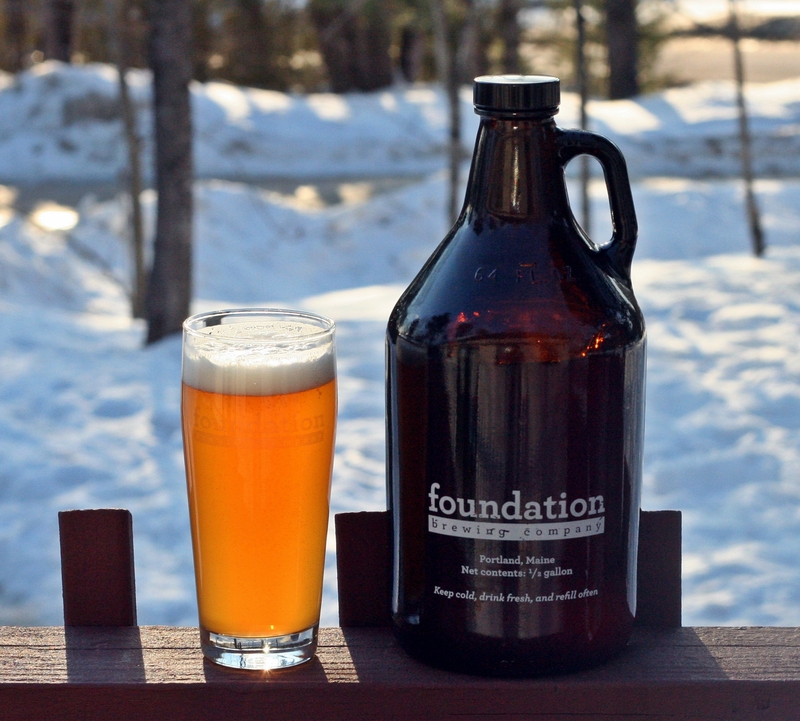 Really enjoyed this beer and hope that Maine starts allowing retailers to fill growlers in the near future. Brewers Description: Our single-hopped Wheat IPA. This beer was launched as part of our I.P.April– a month long celebration of hoppy brews–and we decided to brew it with a different hop each year. Until we brewed it with Citra and then, well, we never turned back. Completely satisfyingly awesome in its crispiness and over-all well-rounded hopaliciousness. 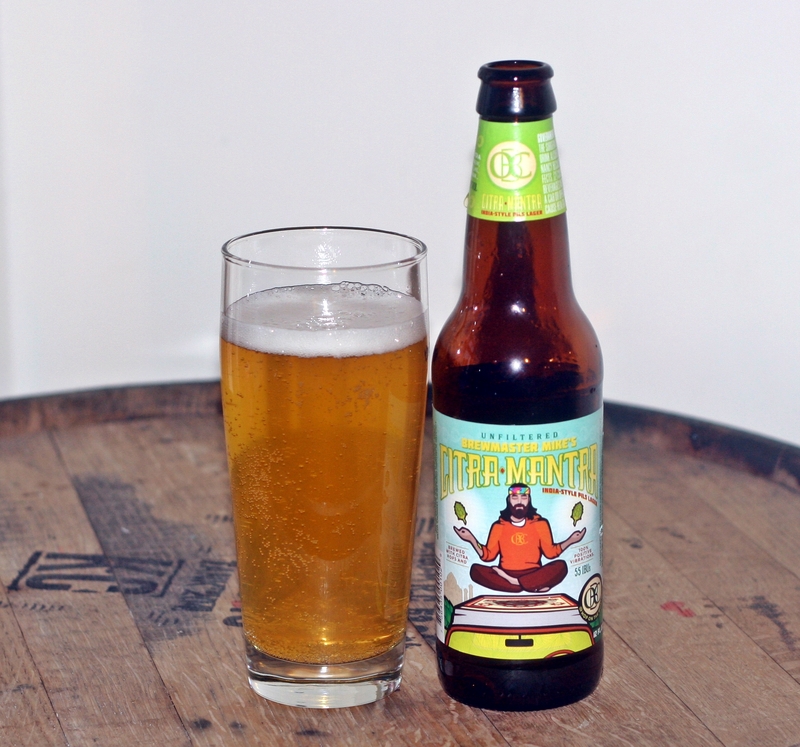 This beer might just be your Rushmore. This is my forth beer from Backlash and I have enjoyed every one. They have one of the best logos in craft beer nd their early beers all had wax dipped bottles which was a very cool addition to an already appealing package. Riot is part of their double IPA series which started out as a 3 beer series but they have now added a forth beer. Riot pours a beautiful orange color with a single finger white head. Aroma is a little subdued compared to other DIPAs but still very nice. Plenty of citrus, pineapple and a bit if pine. Not a lo of bitterness but it is there. Overall this is a well balanced DIPA that preserves the hops but is still pretty well balanced. Looking forward to more from Backlash. RateBeer recently released its list of top breweries in the World and AleSmith was this years number one. I have no idea what goes into producing the list but there is no doubt AleSmith makes some excellent beer. It just happens that I picked up a bottle of their IPA on a recent trip to Mass so I decided to open it. This beer pours a great orange color with a thick off white head. Lots of fresh hops in the aroma with a bit of everything; citrus, pine, pineapple, grapefruit. Very appealing beer. 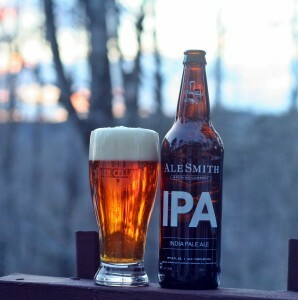 AleSmith’s IPA tastes similar to the smell with a solid amount of hops but all of this is extremely well balanced. This is not a huge in your face IPA with massive amount of hops but it is what a single IPA should be; crisp, clean, balanced and extremely drinkable. Would love to visit the brewery and try some truly fresh beer but in the meantime I will enjoy the bottles I come across on my visits to Mass or Vermont. Brewers Description: Deep golden to light amber color, and a nice off-white head, with good retention when properly served. Starts off with pleasantly strong hop flavors, balanced by a firm malt backdrop, then fades to a dry finish with a lingering hoppiness. 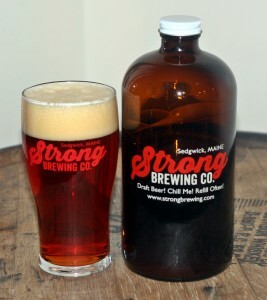 This was the second beer I brought home from my visit to Strong Brewing. Bloody Valentine is their hefeweizen brewed with blood oranges. Fortunately the brewery is small enough that AleSmith probably won’t bother them regarding the name as they have an amber ale named My Bloody Valentine. AleSsmith is brewed in California but in today’s beer market with cease and desist letters and lawsuits being filed on a regular basis it is similar enough that I would not be surprised if they received a letter from them in the future. Bloody Valentine pours a very clean light orange color with almost no head. Aroma is typical of a hefe with some spice and maybe a bit of banana, didn’t really get any blood orange in the nose or taste. I was hoping for more from this beer as I really like hefeweizens and the thought of adding blood oranges for a more pronounced citrus flavor sounded like a great combination. Unfortunately it missed the mark for me, again not a bad beer and I did finish the entire 64 ounce growler it just left me wanting more. Brewers Description: February Limited Specialty – a HefeWiezen made with blood orange. Made my first trip to Strong Brewing in Sedgwick Maine on my way back from a recent trip to Bar Harbor. They had 4 beers on tap when I was there including The Maineiac, their double IPA. 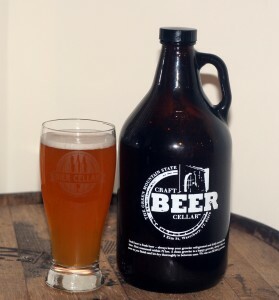 I love DIPAs but I did restrain myself and only brought home a 32 ounce growler instead of the full 64 ounces. This is a big beer at 10% ABV and when beers get that big I find some brewers lose the hops to the massive amount of malts used to try to balance the beer out. I know very little about the intricacies of brewing as I drink beer, I don’t brew it but there are great DIPAs that don’t lose the hops; Hill Farmstead’s, Heady Topper, Calcutta Cutter, Lunch, etc and then there are beers like The Maineiac. This beer pours a deep orange with a thick off white head. Aroma is strong but more towards the sweet malts than hops. Taste is about the same with loads of sweet malts which overwhelm the hops. Alcohol is also quite apparent which is not surprising for a 10% beer. The Maineiac was certainly not a bad beer but just not what I prefer from my double IPAs. Brewers Description: A double IPA for the hop lover. I love hoppy pale ales and there are many more choices now with Hill Farmstead Edward, Maine Beer Mo being a couple of my favorites. With Trillium’s Fort Point I can add a third to this list. Fort Point pours an unfiltered but bright orange with a thick head. Nothing but hops in the aroma; loads of citrus and some pineapple. Taste adds a bit of pine and grass but is still dominated by the citrus hops. Almost no bitterness to be found in the finish. This is a very drinkable pale ale with plenty of hop goodness to keep hop heads happy. Brewers Description: Layers of hops-derived aromas and flavors of citrus zest and tropical fruit rest on a pleasing malt backbone in our Fort Point Pale Ale. Dangerously drinkable with a dry finish and soft mouthfeel from wheat. Our year round hoppy pale ale culminates in a restrained bitterness and dry finish. 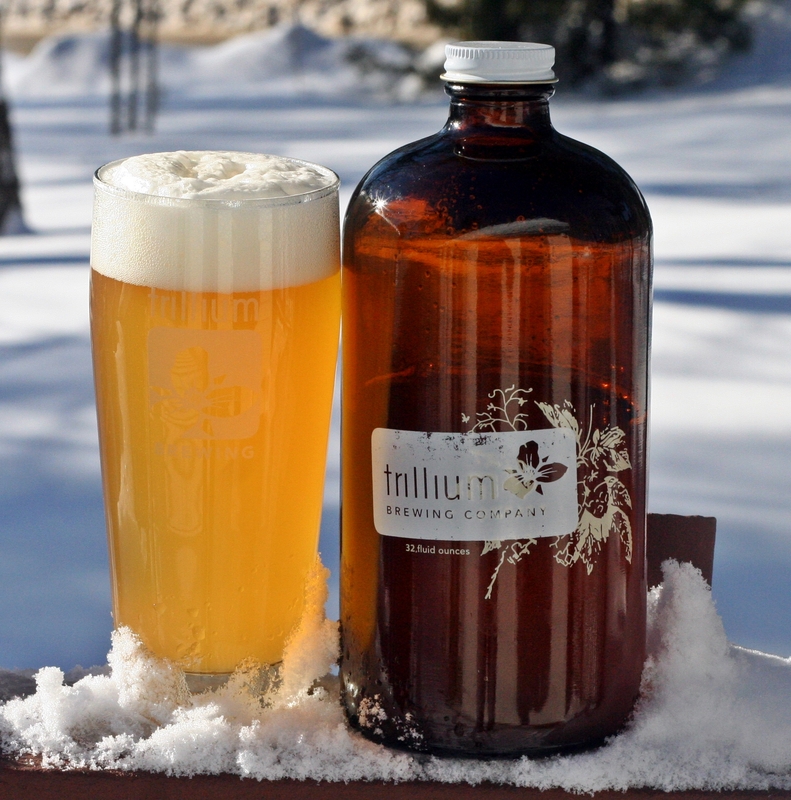 I do not make it down to Boston often but had been reading good things about Trillium Brewing. Fortunately someone that I met through my blog lives in Boston and makes regular trips back to Maine. 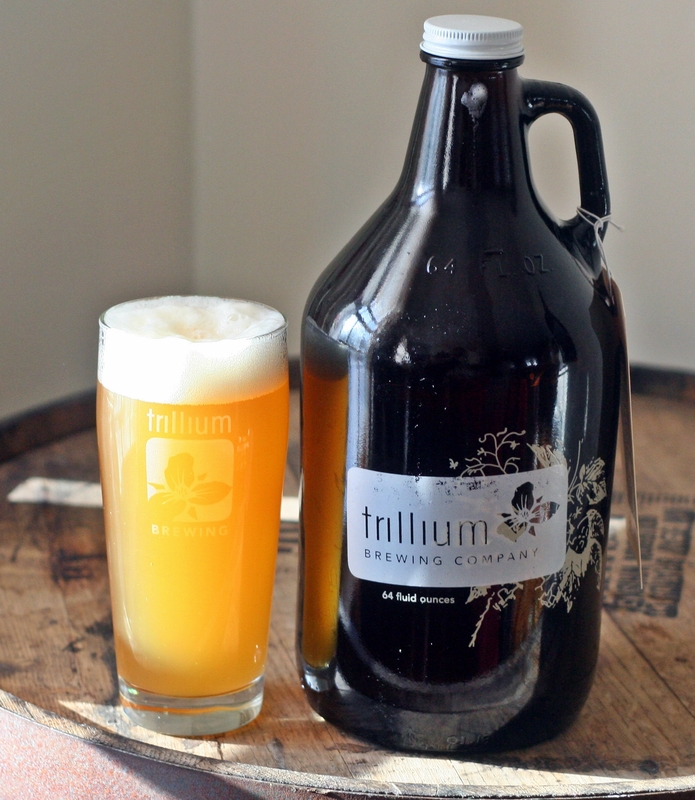 He was nice enough to grab me a couple growlers and of course the proper glassware so I could try some Trillium beer. This one is a wheat ale that is well hopped. Appearance is a bright yellow with a thick white head. Aroma was a nice mix of lemon, citrus and a slight sweet spiciness. Stumpy Duck is certainly a hop forward beer with lots of citrus, lemon in the taste and a fair amount of bitterness in the finish. For my first beer from Trillium I am impressed and if you like hop forward beers than you should definitely make the trip to check them out. Brewers Description: American wheat ale with 30% valley malt wheat. 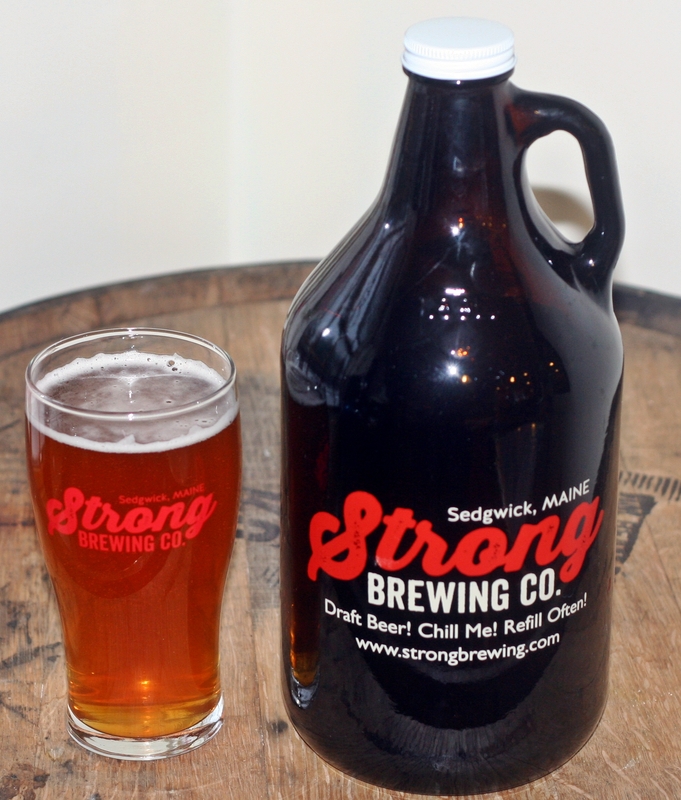 assertively hopped with colombus, chinook, and falconers’ flight. Two lagers in a row, that does not happen often. Citra Mantra is part of the Brewmaster Mike series that brought up Double Dose and Kind Ryed two of my favorites from Otter Creek. This is not your typical lager as it is extensively hopped using Citra and the light lager really allows those hops to shine. Appearance is a pale orange with a slight white head. Aroma is full of citrus which shouldn’t come as a surprise from the Citra hops. Taste is where this one really shines with a crisp lager base and plenty of grapefruit, grass and orange flavors. Finishes with a fair amount of bitterness which helps make this beer that much more drinkable. Overall an excellent beer and I look forward to more offerings from Otter Creek in the near future. There has been a fair amount of press about Blue Lobster over the past few months and not all of it has been positive. 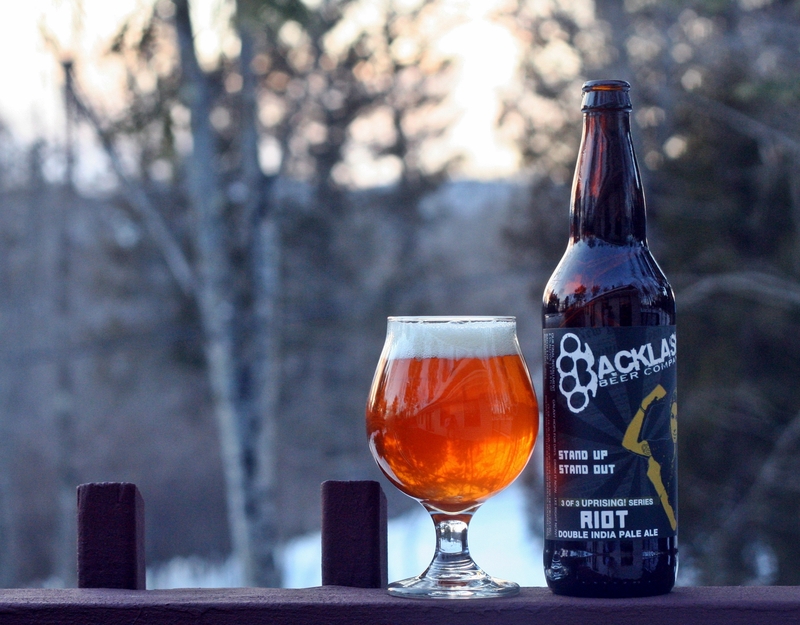 The firing of brewer David Sakolsky and subsequent actions. I am not going to go into any of that here and stay focused on the beer. 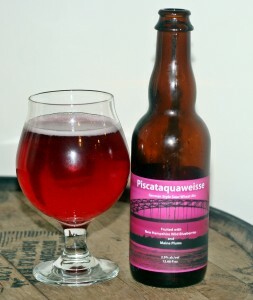 Piscataquaweisse was brewed when David was still at Blue Lobster and was one of only 3 beers that made it into bottles. This one is a 375 ml bottle purchased at the brewery. In addition to being an excellent beer this one also takes the honor of lowest ABV beer I have reviewed, not too many options out there uner 3% alcohol. Appearance is a beautiful red/pink color with almost no head. Aroma is slightly tart and fruity. It has been a long time since I tried a plum so not entirely sure what they smell/taste like but this beer used both blueberries and plums. Taste followed with some nice juicy fruit up front and a light tart finish. I have not tried many Berliner Wiesses so I a far from an expert but this was an excellent beer that I had to keep reminding myself to drink slow and enjoy. Brewers Description: Brewed with NH Wild Blueberries and ME Plums.